Our new Interactive Analysis tab allows you to literally interact with the various charts on the screen. 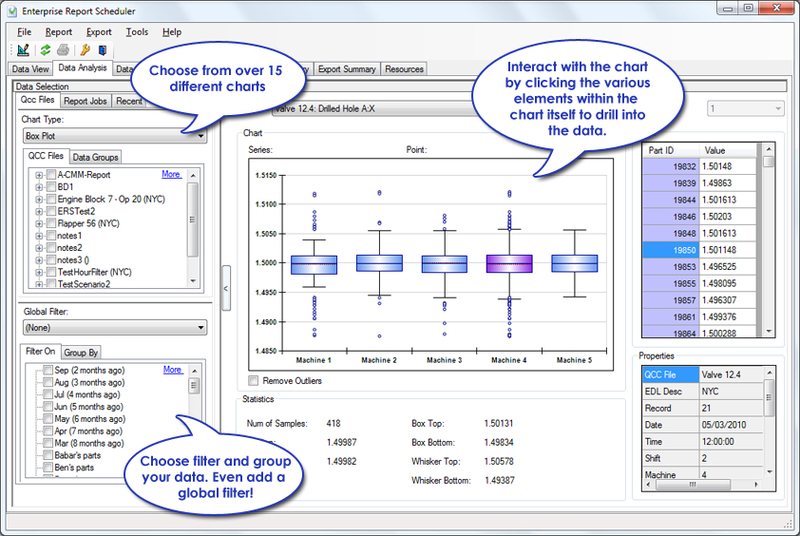 Start by choosing a chart type from an expanding list of over 14 different charts. Choose the features you want to compare from the QCC Files in the list. Finally choose one or more record filters and click Refresh. The data will automatically be grouped based on the chart type and displayed in the main area of the screen. Click on the individual elements within the chart to drill in. Double click to zoom in on the chart. Move your mouse over the elements. Change the subgroup size. There are so many options. Like what you see in your results panel? You're only 2 steps away from scheduling a report. Simply tell ERS to memorize your current chart and it will create a scheduled report job. The only things you have to tell it is how you want it delivered (via PDF attachment to email, etc.) and when you want to run it (daily, weekly, monthly, etc). So let's say you have 5 filters and you're running a chart comparing machines 1-5. A global filter will allow you to apply an overall filter to your other filters. For instance, let's say you apply a filter that gets only the last month of data. Now the chart will be showing machines 1-5 for only the last month. You can filter and group your data any way you choose by simply choosing different combinations of filters. Below the charts are descriptive statistics that change depending on the displayed chart or selected item. In the chart above, the user clicked the 4th box in the Box and Whisker plot so the statistics shown apply to that one box. Want to run your reports on-demand in the window? Simply click the Report Jobs tab in the top left corner and your existing scheduled jobs will appear. Choosing one of them will run the current chart and statistics interactively without the need to print the report on paper. Below is a list of currently supported interactive charts. This list is currently expanding to include even more interactive charts and does not include the custom charting and gauges that can be added into the report templates themselves.